Today is spring break! Just today. They were supposed to have a whole week, but after all of the snow days this winter they’re left with just this one day. So we’ve packed a whole week’s worth of fun and adventure into this day. To that end, we’ve … cleaned their room! Watched some cartoons! drawn some cartoons! Played with legos! Yes, it’s a vacation they’ll never forget. And we went for a walk. As ever, Clio pulled ahead, lunging at every squirrel and cat and bird, and the boys trailed behind, talking. I heard them earnestly discussing who they were going to be. They were deciding what creatures they would be in the world of their invention. How they would look, and what they’d wear, and how they’d get along with each other. They are telling stories as we walked. And then they caught up with me and told me they’d just downloaded themselves into the world my brother and I invented when we were little. All of our imaginary worlds are joining together to form one great world without end! It made me so happy to hear them talking, and all the more so because I myself was walking along ahead of them completely lost in the world of my novel, creating a world of my own. It’s become so real to me, and so complicated, and I’m so close to it that I only think I ever consider it rationally when I’m out walking, trying not to think about it. Then I catch glimpses of the whole world and all the characters in it, and I wonder what they’ll do next, I wonder how the whole thing will turn out. And it makes me so happy to catch these glimpses of the world I’ve created, most of the time, when it’s going well. I’m glad the boys have that, too. I hope they never lose the ability to create worlds for themselves and each other. I would wish that superhero skill for everyone I know, because sometimes this real world is a little too real. And now, a novel gets written one word at a time, it might be swirling around in my head in great waves, but it comes out one word at a time (and then that word gets erased and replaced with a few, possibly better, words, and then they get erased…) so I’d better get to work. This is similar to a perfectly ordinary spinach quiche, except that it also has ricotta and mozzarella, which makes it juicy. 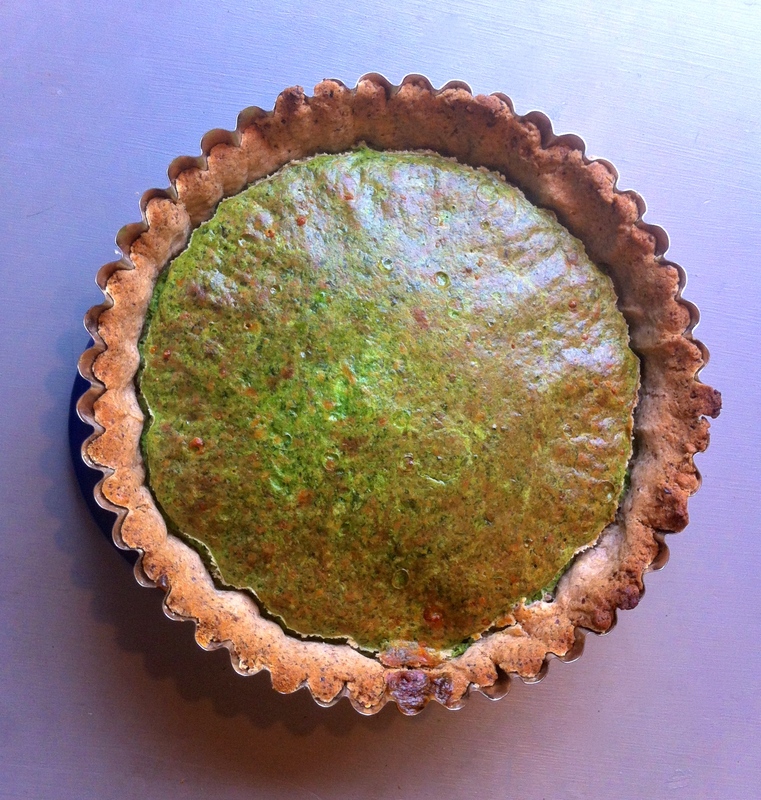 And it has tarragon, which makes it very fresh and springlike. It’s simple, and made more interesting with the addition of the pecan crust. Mix the flour, pecans, salt and pepper in a bowl. Grate in the butter, and mix with a fork till you have a rough and crumbly consistency. Add just enough water to pull everything into a workable ball. Knead briefly, to be sure everything is combined, and then wrap it in foil and chill for at least half an hour. Combine everything in the food processor and process until smooth. Preheat the oven to 425. Lightly butter a tart pan with tallish sides, or a pie plate. Roll out the dough and press it into the pan. Don’t worry about making the edges nice and neat, you can leave them “rustic.” Pour the filling into the shell, and bake until ti’s puffed and golden, and the center isn’t wobbly. Let it cool a moment (it will deflate slightly). Slice and serve. 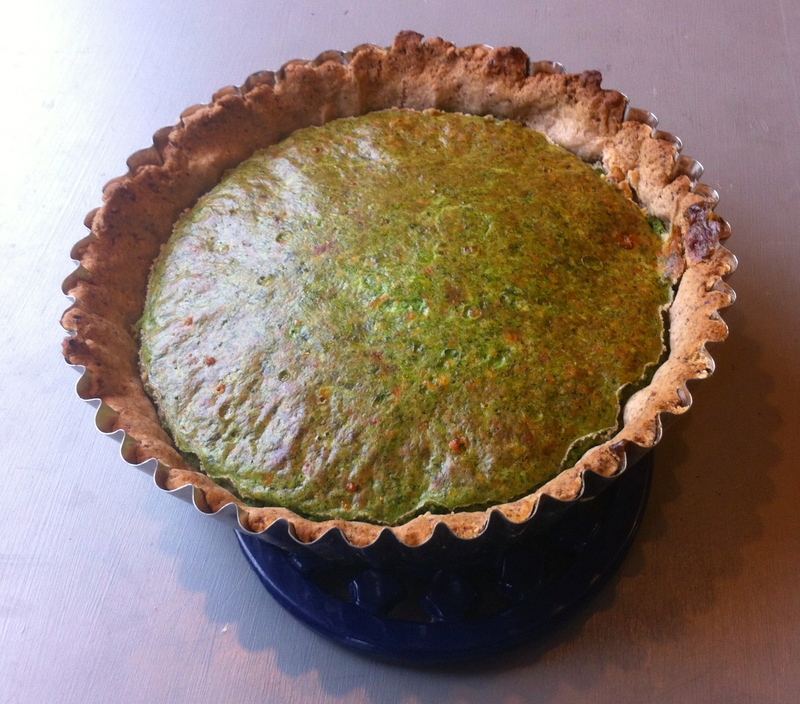 This entry was posted in basic pie filling, crust, pie, recipe and tagged ricotta quiche, spinach tarragon, tarragon quiche by Claire. Bookmark the permalink. I should have commented sooner; I discovered your blog when your nut-based sauce article appeared on the NPR site. My wife & I are mostly vegan, but not obsessive about it. I’ve experimented with a bunch of nut-based sauces, and your article added several to our stable of regulars. One nice thing about these sauces is that they freeze well; I put them in quart-sized ziplocks, smoosh them flat, and then can break off the frozen pieces when I need them. I have about a dozen that I regularly use, and it really facilitates food prep when I don’t have to also make all the sauces. I should also mention that many of the recipes on your blog can be easily converted to vegan; for example, today I made my version of the ragged-pasta recipe…but used a fake mozzarella and sour cream instead of the real thing. I have a pasta machine, so I made sheets, and layered it into a lasagna-type dish; pasta, filing, pasta, filing, pasta, sauce. It was fantastic! We find your recipes very unique and tasty…and your blog very entertaining. Keep up the good work!